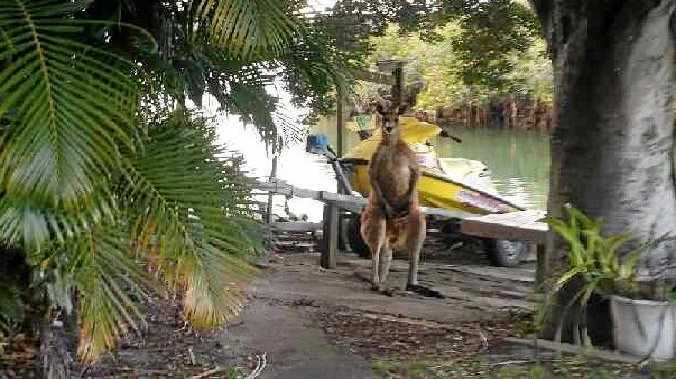 A SIX foot muscly male kangaroo has surprised a resident early on Monday morning by making an unusual appearance at his Kennedy Dr waterfront backyard - only accessible at low tide. Tweed lawyer Carl Edwards said he was confronted by the giant animal when he went outside to chastise his cattle dog, Jess, for rattling in the rubbish bin at about 6.45am. "Jess dropped everything to go after the kangaroo but she didn't attack it, she got intimidated. He was standing on his tail and back legs," Mr Edwards said. "I wasn't game to come any closer than 10 feet - especially not in the mood he was in." 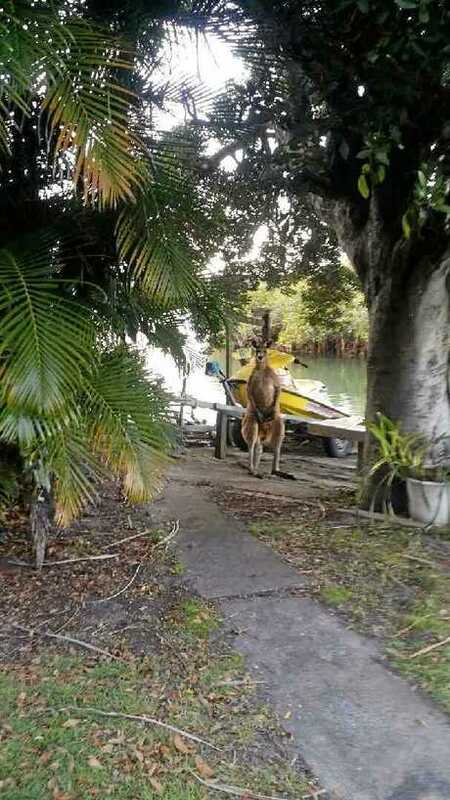 The Roo hopped off 20 minutes after the confrontation, leaving Mr Edwards unsure of how the animal came to get itself "marooned" on his block in the first place, unless it came during low tide. 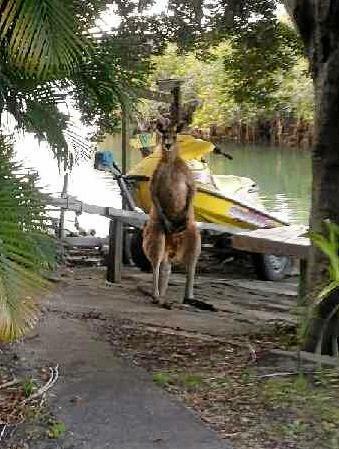 Currumbin Wildlife Sanctuary senior vet Dr Michael Pine said the Roo may have swum to the home, but if it did it may have been under duress. "They can be comfortable swimming short distances to cool down or to have fun but not to get somewhere with a real purpose," he said. Dr Pine said any lone Kangaroo was likely to have separated from its mob unintentionally, frightened by wild dogs or cars and Kennedy Dr was an unlikely habitat for the animal. 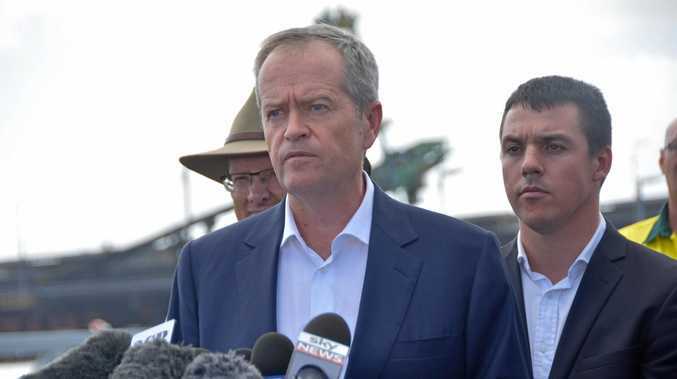 "It happens unfortunately, there's a lot of wild dogs and kangaroos end up on the beach, swimming in the surf and crazy stuff like that," he said. "Something has really frightened this animal - he may have crossed the road from his usual country and got a hell of fright from a car but most likely it would be dogs chasing it. "If a Kangaroo is uncomfortable, outside of its environment and away from its mob, its going to be stressed out of its brain, and it would kick you, so I'd definitely be steering away from it." Instead of approaching the animal, Dr Pine said to call Currumbin Wildlife Sanctuary at Currumbin or Tweed Valley Life Carers. "A big guy like that - known as a macropod - can get some serious muscle problems. "Kangaroos are designed to run fast in a straight line and they're not designed to stop and start, so if it gets cornered that can cause terrible problems for the animal. "Their muscles can melt from an overdose of lactic acid." Currumbin Wildlife Sanctuary: 07 5534 1266. Tweed Valley Wildlife Carers: 02 6672 4789.